Chef Belinda (Belinda Smith-Sullivan) between Aiken, S.C. and Augusta, Ga., is opening up new markets for her gourmet spice blends among the finest possible company – the kind of folks you’d like to move in next door to. 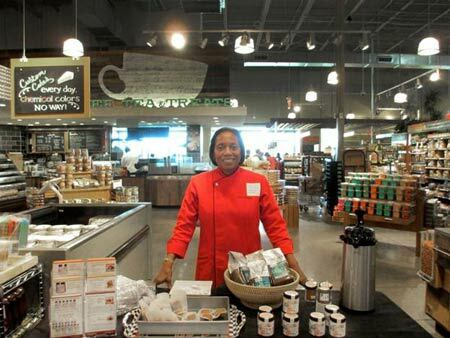 After an ‘apprenticeship,’ manning a table outside the store, Chef Belinda made it to the shelves of the very high-end Whole Foods store in Columbia on Oct. 23, and she couldn’t be more thrilled. That is, until her next major accomplishment. Already renowned in the Aiken/Augusta area for over five years for her personal chef services and her incomparable event planning and hosting, she opened up her own “on-line line” of spice blends about three years ago to rave reviews – and sales – at www.chefbelinda.com. “I market my blends as an ‘artisan’ product, meaning I mix them in small batches so the freshness is not compromised,” she explains. The mixing and packaging are an art, combining exotic and very fresh spices from many sources she has developed across the globe. Chef Belinda is a graduate of Johnson & Wales University with highest honors in Culinary Arts. She is certified in Wine Studies from the Culinary Institute of America in California’s famed Napa Valley. She is getting so successful at her marketing, no doubt due to the quality of her product, that those “small batches” might require some help soon as Chef Belinda’s spices catch on with good cooks around the area and the country. Since opening her on-line store of four spice blends, she now has 11 and was recently invited to display and sell them on OpenSky network, https://www.opensky.com/chefbelindaspices, an online mall of high-end stores and products, giving her much wider exposure to stylish cooks everywhere. “If you go to OpenSky, you will see hundreds of stores. A lot of extra traffic is directed to my store being affiliated with OpenSky,” she said. That has been a big accomplishment, but making it to the shelves of the Columbia Whole Foods market was a significant commitment of her physical presence for several months. “I’m a member of the South Carolina Specialty Foods Association and met representatives of Whole Foods at our annual meeting, where we talked about how we could get our products into their stores, which is a extensive process,” Belinda recalled last month on her day of triumph. “It was so daunting, so much paperwork, but I worked through it with their local vendor liaison Kat Mooney-Cantey, and she recommended me up the chain. Once you begin the approval process, local vendors are invited to set up booths outside the store on weekends. I made many repeat customers and was finally approved to move into the store. This was the one-year anniversary of the opening of the Columbia store so there were many customers attracted by their promotion,” she explained. It may not surprise that Chef Belinda has further plans. Contact Chef Belinda (Belinda Smith-Sullivan) Chef Belinda Spices at 803.552.6450 and belinda@chefbelinda.com. Read her Flying Foodie blog – she is a pilot and lives on a private airport in Trenton, S.C. with her plane in her oversized garage/hangar – at flyingfoodie.blogspot.com. See all of her services, including Chef Belinda Spices at www.chefbelinda.com. 2 Responses to "Local Chef Cracking New Markets with Specialty Spice Blends"
Yesss!!! I am so excited for you, Chef Belinda! It’s about time others found out how great your spice blends are. I look forward to trying out your coffee blends this holiday season. Congrats ChefBelinda!! I enjoy your spices and recently cooked a shrimp etouffette for my colleagues at work that they thoroughly enjoyed. And you know its the spices that make a cajun rue. Gonna get some more!